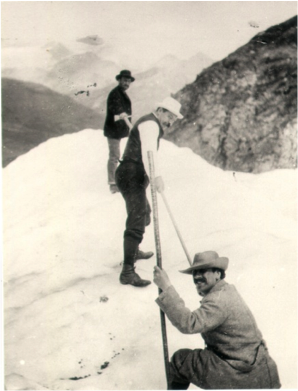 "Alpine Adventures - Arthur Conan Doyle and Switzerland"
Download full programme here (PDF). "We have enjoyed Davos immensely. It is a rare place for work or sport. I have done 100,000 words & had as many tumbles so I can answer for both. Snow-shoeing is particularly good fun. 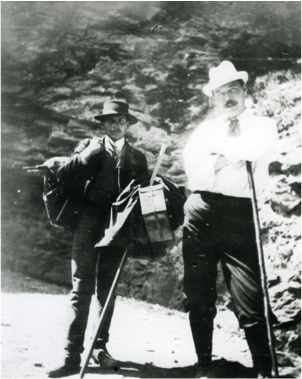 I spend a good part of my time now among the mountains", Arthur Conan Doyle wrote to James Payn on 22 March, 1894. These few lines were written a day before his epic skiing excursion with the Brangers brothers to Arosa that made Doyle one of the first promoters of skiing. In the life of and work of Conan Doyle, Davos, and, of course, the Reichenbachfall play a significant role. However, Switzerland figures in other Sherlock Holmes stories and short stories. Doyle returned with his family to Switzerland for summer holidays, too. In addition, Switzerland was the home to Doyle's younger son, Adrian Conan Doyle, whose four years at the Chateau of Lucens right at the end of his life were not without controversy. These and other aspects may explain why Switzerland houses one of the most exquisite collections of Doyle letters, family papers and memorabilia at the Library of the Canton of Vaud in Lausanne as well as the original of the manuscript of The Abbey Grange that can be admired at the Bodmer Foundation in Geneva. We from the The Reichenbach Irregulars of Switzerland therefore believe that there are many pertinent reasons to devote, for the first time ever, an entire weekend to debate and discuss the role Switzerland played in the life and work of Arthur Conan Doyle. The confirmed guest speakers at this stage come from Germany, Switzerland and the USA and guarantee interesting insights and lively debates. They will examine some of the well known but also some of the less well known "Swiss connections" as well as other significant aspects of the the literature of Arthur Conan Doyle that are unique to the German speaking part of Europe. We are certain that there could be no better place than Davos to do exactly that - at the Schatzalp Alpine & Mountain Resort, a historic art nouveau hotel, that opened in 1900 and is splendidly situated at 1860 meters above sea level. We hope you will join us for Alpine Adventures during the weekend from 26 to 28 September 2014! Arrival and check in at the Schatzalp Snow & Mountain Resort as per individual travel arrangements. Davos is easily reachable by train, for example from Zurich Airport to Zurich, then via Landquart to Davos Platz. See Accommodation and Access for more details further below, including parking facilities if you come by car. At 14.00 we meet in the lobby of the Schatzalp Snow & Mountain Resort and descend by funicular to Davos. We commence our weekend with a visit to the Winter Sports Museum Davos. We plan for a local historian to give us some insights into the history of Davos, in particular the exciting evolution from a health resort to a tourist destination that transformed Davos in the late 19th century, the time Arthur Conan Doyle and his wife Touie and other members of his family spent an extended period of time there. This presentation is followed by a lecture delivered by Vincent Delay about Doyle's epic skiing tour from Davos to Arosa on 23 March 1894. Vincent's lecture will be enriched by a reading of certain extracts of Doyle's essay An Alpine Pass on Ski, published in The Strand Magazine in winter 1894. We then stroll through the Davos Kurpark to pay homage to The perfect pattern of a gentleman, as the inscription of a memorial plaque commemorating Arthur Conan Doyle's contribution to skiing reads. This plaque was unveiled by Adrian Conan Doyle and members of the Sherlock Holmes Society of London in 1968. Before ascending to the Schatzalp, we intend to take tea and cake at the Grand Hotel Belvedere, where Doyle and his wife Touie spent part of the winter 1893 / 1894. We plan to dedicate a memorial note to commemorate Arthur Conan Doyle's stay in this hotel. Dinner at the Schatzalp, followed by the welcome lecture "Beyond Reichenbach: Switzerland in the life and work of Arthur Conan Doyle" by Michael A. Meer, BSI, and Marcus Geisser, BSI. A series of lectures on numerous aspects of Arthur Conan Doyle and Switzerland, and beyond, will commence after breakfast. Please note that following lecturers have confirmed their participation. We are currently in touch with other potential speakers and so this list is not exhaustive. It is in alphabetical order only and, as always, subject to change. The precise titles of the papers of our lecturers will be made known when available. Some papers will be delivered on Sunday morning. Peter E. Blau, BSI, from Bethesda, Maryland, USA. To the universe of Sherlockians, Peter is the Sherlockian who hardly needs any introduction. Amongst other things, Peter will deliver particular insights into his visit to the opening of the Sherlock Holmes Museum at the Chateau de Lucens in 1966, where Adrian Conan Doyle lived from 1966 until his death in 1970. Vincent Delay, from Lausanne, Switzerland, is the founder of the Société d'études holmesiennes de la Suisse romande. He has published a series of monographs on numerous Holmesian and Doyleian aspects and is the author of highly atmospheric detective stories. He acts as curator of the Sherlock Holmes Museum in Lucens, formerly located in the Chateau de Lucens. In Davos, Vincent will elaborate on the alpine pass on ski that brought Arthur Conan Doyle over the Maienfelder Furka pass to nearby Arosa. Markus Geisser, BSI, recently resettled in Switzerland, is a founding member of The Reichenbach Irregulars. His recent research includes Who was von Bork? (article forthcoming in The Sherlock Holmes Journal, summer edition 2014) and the travel habits of Sherlock Holmes based on a comparison with Horace Vernet (Travel in the blood, delivered at the 2013 conference organized by The Norwegian Explorers of Minnesota). Markus is currently examining what role Switzerland played in the life and work of Arthur Conan Doyle. Jon Lellenberg, BSI, newly resettled in Santa Fe, New Mexico, USA, is editor of the biographical study The Quest for Sir Arthur Conan Doyle, co-editor of Arthur Conan Doyle: A Life in Letters, and, most recently, of "Dangerous Work": Diary of an Arctic Adventure. As the U.S. representative of the Conan Doyle Estate, he will provide, as he puts it, "insights into Adrian Conan Doyle's rather exasperating years at the helm of the Conan Doyle Estate and Dame Jean Conan Doyle's more benevolent period," with some sidelights on the Estate's relations with the Baker Street Irregulars, of which he is the historian. Michael A. Meer, BSI, from Berne, Switzerland, is the other co-organizer of this weekend. An admirer of both Sherlock Holmes and Conan Doyle since boyhood, he will investigate the horror loci of the Hotel Schwarenbach on the Gemmi Pass – the inn that over time inspired not only Conan Doyle but many other writers – such as Zacharias Werner, Guy de Maupassant and Mark Twain. Michael Ross, BSI, from Cologne, Germany, editor, publisher, translator and writer, will present the main conclusions of his seminal research into the quest of the perception of the literature of Sherlock Holmes in the German speaking part of Europe in the early decades of the 20th century. As a seasoned translator - of works such as Daniel Stashower's Teller of Tales: The life of Arthur Conan Doyle - he will also elaborate on the dilemma Du oder Sie, Watson? Free time to enjoy, amongst many other things, the comforts of the Schatzalp Snow & Mountain Resort or explore the village of Davos and some of its spectacular surroundings. We all meet again for dinner at the Schatzalp. This is followed by a selection of cinema, TV, and radio adaptations of Sherlock Holmes adventures that are set in Switzerland. After breakfast, the lecture program continues. We intend to conclude our program before lunchtime with an illustrative lecture, supported by TV cuttings, pictures and slides on the topic of How Sherlockians commemorate Holmes and Doyle in Switzerland. By lunchtime, the program will come to an end with closing remarks by the organizers. Have a safe journey back home and see you again soon! The Schatzalp Snow & Mountain Resort (Address: Schatzalp Davos, CH-7270 Davos Platz, webpage: www.schatzalp.ch) is one of Switzerland's most spectacularly situated hideway hotels. The hotel is located at approximately 1860 meters above sea level, on a sunny terrace at the tree line. Opened in 1900, the Schatzalp is renowned for its art-nouveau style which has been carefully conserved since its opening more than one hundred years ago. The hotel is reached with a short ride (four minutes) from the center of Davos Platz (1560 meters above sea level) on its own private funicular. It cannot be reached by car. The Alpinum Schatzalp located around the hotel is a beautiful botanical garden with 3'500 different species of alpine plants. Schatzalp is also known from the novel The Magic Mountain written by Thomas Mann. In 2008 the Schatzalp won the annual award of The Swiss Historic Hotels. Prices are per person (NOT per room) and in Swiss Francs (CHF). The prices quoted below include overnight stay of two nights, including breakfast on Saturday and Sunday, as well as a four course dinner on Friday and Saturday evening. See the hotel's current price list to find out more about the other services this spectacular hotel offers: http://www.schatzalp.ch/download/SummerRates.pdf. One person, in a double room, when used by two persons, CHF 340.-. One person, in a double room, when used by one person only, CHF 440.-. - Your address, including a phone number, please. Kindly send a copy of your reservation to the organizers, meer@221b.ch and marcus_geisser@hotmail.com. You can reach Ms Zeller under the following telephone number: +41 81 415 51 51. IMPORTANT: Please mention "Arthur Conan Doyle and Switzerland: 26 - 28 September 2014" when you send your reservation as we have pre-booked a certain number of rooms. Please book as soon as possible, but no later than 15 August 2014. Please note that the hotel will ask you to pay the full price in advance (100 %) when you reserve your rooms. Major credit cards are accepted. We thank you for your understanding. Prepayment is required as we have reserved a certain number of rooms in advance. The usual cancellation policies for individual guests will apply, see also http://www.schatzalp.ch/go.cfm?cancel. Please note that upon arrival in Davos, that The Reichenbach Irregulars will charge an additional CHF 30.- per person (cash, please) to cover the costs for the meeting rooms. We thank you for your understanding. All other expenses (drinks, luncheons, and so forth) are not included and will have to be paid individually. Davos is easily accessible by train from all main railway stations, including Zurich Airport (via Zurich main station). Whether you come from Switzerland, Austria, Germany or from further away arriving via Zurich Airport, you usually have to change in Landquart to board the train to Davos Platz. The webpage of the Swiss Federal Railways helps you to get the precise time table: http://www.sbb.ch/en/home.html. Please get off at Davos Platz and not Davos Dorf, which is the other railway station serving another part of Davos. From Davos Platz, you either take the bus (lines 2 or 4, just two stops) or a taxi for the short ride to the station of the Schatzalp funicular, situated in the heart of Davos Platz. You can also walk from Davos Platz Railway Station to the Schatzalp station (approximately ten minutes). If you need further assistance please get in touch with the hotel when you make your reservation. They will be happy to help you. Or check out the Schatzalp webpage, www.schatzalp.ch, for further details. If you come by car, please inform the hotel team when you make your reservations. A limited number of parking facilities are at your disposal in Davos Platz, at approximately CHF 20.- per night. The hotel will help you to locate them. Please note that you cannot reach the Schatzalp by car and that you will need to take the hotel funicular to reach the hotel.